Earlier this year, DeSantis drafted a proposal calling on the U.S. to recognize Syria’s Golan Heights as an ‘integral part’ of the State of Israel. One might note at a minimum that for Ron DeSantis and ambitious slimeballs like him it is all about Israel due to their own political self-interest, with nothing actually in the mix for either Florida or the United States. The uninformed public buys into the narrative because it doesn’t know any better thanks to the media’s heavy slant in favor of Israel, allowing uncritical support for the Jewish state to continue under the radar unchallenged. DeSantis, a former U.S. Navy lawyer, has demonstrated that he reveres Israel even more than his former comrades in arms. In his congressional district there are a number of survivors of the U.S.S. Liberty, which was attacked in international waters by Israel on June 8, 1967, killing 34 crewmen and injuring 171 more. They report that DeSantis has been completely unsympathetic to their requests that a commission of inquiry finally be convened to determine what actually happened on that day. In fact, Americans have never had the option of voting on the “special relationship” that Israel enjoys with the United States as no Congressman would dare run against it lest they be smeared in the media and find themselves running against an extraordinarily well funded opponent benefitting from large donations coming from out of state sources. The list of prominent politicians “taken down” by Israel is lengthy, and includes Cynthia McKinney, Adlai Stevenson III, Paul Findley, Chuck Percy, William Fulbright, Roger Jepsen, and Pete McCloskey. It is particularly ironic that as the midterm campaigns were drawing to a close there appeared some serious investigative journalism that demonstrates precisely how Israel and Jewish groups corrupt the political process in America to provide virtually unlimited support for anything and everything that the despicable Benjamin Netanyahu and his gang of war criminals seek to do. How the process has succeeded is best illustrated by the current Israeli government’s policy of “mowing the grass” in Gaza where it is using army snipers to kill unarmed Palestinian protesters. Washington not only does not protest against the in-your-face war crime, it aids and abets it with U.S. Ambassador David Friedman justifying the military response as measured and appropriate. Another area where Washington chooses to look the other way is regarding Israel’s nuclear arsenal, believed to consist of two hundred warheads. Under U.S. law, any country that has an undeclared nuclear weapons arsenal cannot obtain American-made weapons and cannot received aid of any type. 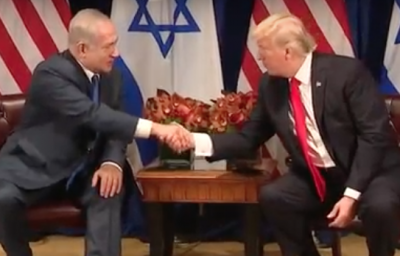 Congress and the White House pretend that the Israeli nuclear arsenal does not exist, in spite of the fact that the Israelis themselves have more than once implicitly acknowledged it and instead of cutting aid to Israel have instead increased it. It is currently $3.8 billion per year guaranteed for the next ten years, with extra money also available if needed. No other country benefits from such largesse and gives in return so little. To be sure, the groundbreaking book The Israel Lobby and U.S. Foreign Policy by professors Stephen Walt and John Mearsheimer, which appeared in 2007, pulled no punches in describing how the Israel Lobby operates in the United States. It also made clear that the relationship with Israel serves no United States national interest whatsoever and exists solely because of the corruption of the political system and the media by principally Jewish individuals and groups that are dedicated to that task. While acknowledging the great debt to Walt and Mearsheimer, it is one thing to read about something in a book and quite another thing to see it live, which is what the new evidence of Israeli interference consists of. Several years ago, the Qatari news service al-Jazeera commissioned two investigations. The first was on the activities of the Israeli Lobby in Britain and the second was on the lobby in the United States. The material consisted largely of meetings with members of Israel’s active lobby that were secretly filmed by journalists who were pretending to be supporters and who eventually managed to penetrate some of the organizations that were most active in promoting Israel’s interests. The British expose, in two parts, aired in January, and was based on discussions and interviews that took place between June and November 2017. It demonstrated how the Israeli Embassy in London connived with government officials to “take down” parliamentarians and government ministers who were considered to be critical of the Jewish State. It also revealed how the Israeli Embassy was secretly subsidizing and advising private groups promoting Israeli interests, including associations of Members of Parliament (MPs). The four-part series by al-Jazeera on the Lobby in the U.S. was meanwhile temporarily spiked because the Qatari government was seeking to obtain the mediation of prominent American Jews to pressure the White House to help resolve its outstanding conflict with Saudi Arabia and the United Arab Emirates. The documentary has remained in limbo but in the past two weeks it has surfaced and is now available. Its undercover investigative journalist, a British Jew named Tony Kleinfeld, quickly charmed his way into the inner circle of Israel’s supporters where he discovered a network of organizations that act as fronts for the Israeli government. Their activities include spying on supporters of Palestinian rights and disrupting demonstrations, with a particular focus on the Boycott, Divestment and Sanctions movement (BDS), which Israel has particularly targeted. They also resorted to tactics like smearing critics by generating false accusations of sexual and personal misconduct, all of which was coordinated by Israel’s Ministry of Strategic Affairs. The ministry’s director general is Sima Vaknin-Gil, a former senior officer with Israel’s military intelligence, and is staff consists mostly of former spies drawn from Israel’s various security agencies. In a recorded conversation, Project employee Jordan Schachtel, explained the objectives and extent of a secret Facebook operation. In another bizarre episode, Kleinfeld visited the neocon dominated Hoover Institute in California where he participated in a demonstration together with a group of bored young conservative think tankers compelled by their professors to protest against a Students for Justice in Palestine conference. The think tank fellows admit that they were “astroturfing” – rent-a-crowd activism to make a small demonstration appear much larger. In his recording, Milstein also talks about the need to “investigate” and “expose” critics of Israel, who Milstein claims are anti-Semites, as well as “anti-Christian” and “anti-freedom” activists who “terrorize us.” His foundation also funds numerous anti-Palestinian organizations, including the Israel on Campus Coalition, StandWithUs, CAMERA, the AMCHA Initiative and the FDD. Milstein also funds and is chairman of the board of the Israeli-American Council. An Israeli-born California based real estate developer, Milstein reportedly served time in federal prison after a 2009 conviction for tax evasion. An Israeli spy at the University of California at Davis, Julia Reifkind also described to Kleinfeld how the system worked at the campus level. She used multiple fake Facebook accounts to monitor the activities of Students for Justice in Palestine. “I follow all the SJP accounts. I have some fake names. My name is Jay Bernard or something. It just sounds like an old white guy, which was the plan. I join all these groups.” The information she obtained was then passed on to her contact in the Embassy for forwarding on to Israel to be entered into their data base of enemies. So, Israel was engaging in interfering in legitimate political activity and also generating fake news on the social media in both 2016 and 2018, the same accusation that has been leveled against Moscow, but Special Counsel Robert Mueller seems curiously uninterested. And beyond the al-Jazeera revelations, there is also the evidence that it was Israel that sought favors from the incoming Trump Administration in 2016, not Russia. So who was actually corrupting whom? And then there are the more overt Israeli front groups like the American Israel Public Affairs Committee (AIPAC) with its $100 million annual budget and 200 employees, as well as the other special arrangements to pander to Israel and the powerful American Jews who have made it their mission to use the U.S. government as a mechanism to protect and nurture Israel. Last week in Los Angeles $60 million was raised by Hollywood’s finest for the Israel Defense Forces (IDF), “Their Job is to Look After Israel. Ours is to Look After Them,” the website proclaims. Last month, an additional $32 million was raised for the IDF in New York City. Donations are tax exempt, to support the armed forces of a country that is currently engaged in war crimes and that has a secret nuclear arsenal.